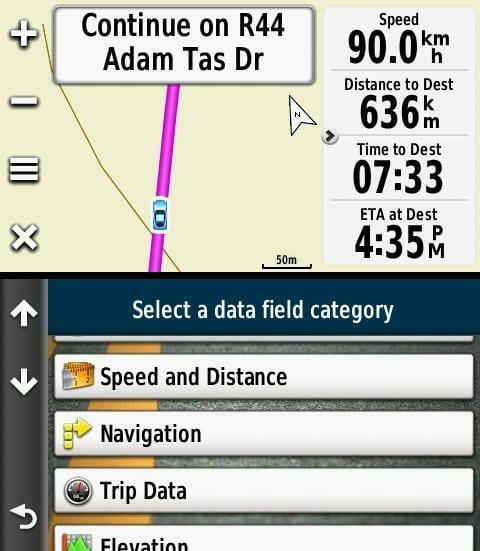 Your GPS loaded with the Tracks4Africa map is your best travel companion when you navigate the backroads of Africa. However, your GPS is more than just a navigational tool; it is also a source of valuable information. It is able to determine your position and display it on a map which in itself provides reliable orientation, solving half of your navigation problem. The GPS is also able to calculate an exact route to your desired destination and navigate you turn-by-turn. Although this makes life a lot easier for you, there is also some danger in blindly trusting the device. It works perfectly most of the time, but it is wise to keep your own mental map intact and to evaluate the GPS’s suggestions to see if they agree with your ideas. Occasionally the GPS routing option selected may not be that which you prefer. However, by using your common sense, you and your GPS will make a formidable navigating team! The ETA (estimated time of arrival) given by your GPS won’t only help the backs-seat drivers, it will also assist you in knowing if you will reach camp before dark or how much time you have available for your lunch stop. Displaying time and distance to destination are some of the options that are available for viewing on the screen. You can change your viewing options by pressing and holding the different fields. Remember that your GPS will calculate your route according to whether you have selected the shortest distance or fastest time routing option. You will find that this can make a huge difference to which route you will follow. So once the GPS has calculated your route, zoom out and check if that is in fact the route that you want to follow. To change the shortest distance/fastest time setting, go to Setup, Routing and Calculation method. If you are looking for a little adventure, then select the counter intuitive routing option, say shortest distance, for your day’s journey and see where it takes you. We have had some delightful surprises when we opted to travel like this. You can plan your trip perfectly before you leave, but it is ideal to allow yourself the freedom to change your route as you go along. You might realise that you have enough time available to take a more scenic route to your destination, rather than the fastest time route. Where do we sleep/eat/fill up? 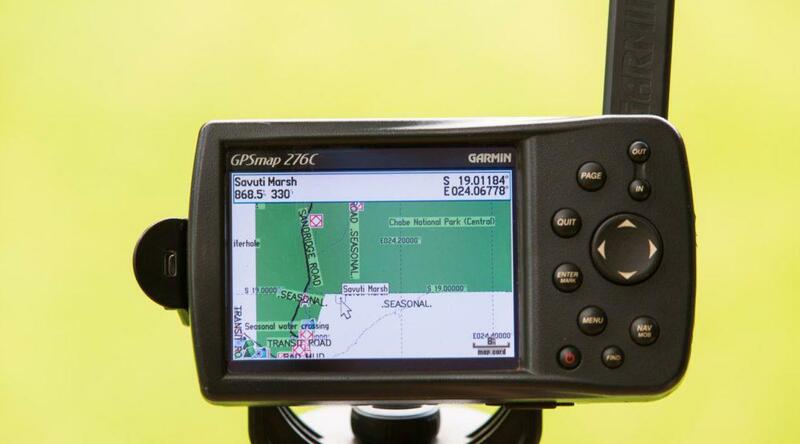 One of the most overlooked uses for a GPS is that it is a valuable source of data. Your GPS contains a map which is packed with information on just about anything you would need to know to make your journey pleasant. It can answer all the questions that are vital to overlanding! Where do we sleep/eat or buy supplies/fill up, find emergency services and even what can we see or do here? If your GPS is loaded with a recent version of the Tracks4Africa Traveller’s map and you use it properly, it will prove to be literally as good as a guide book or guide app. There are various ways in which you can search for this information, which are all to be found as Points of Interest under your GPS’s main menu. If you know the name of the Point of Interest, you can search for that specific name, but be sure to spell it exactly. 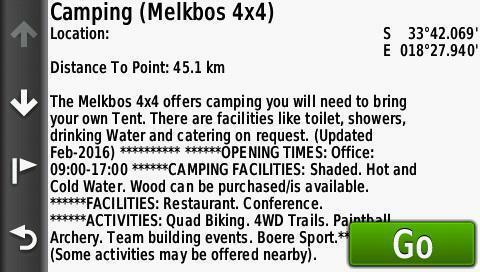 However, if you are looking for a fuel stop or a campsite without knowing its name, you would search by category. How to search different categories. The GPS will show you all results in that specific category. The default search will always be around your current position and results will be listed in sequence of how far they are from you, starting with the nearest. However, you have to keep in mind that, until you start navigating to a destination, its distance is measured in a straight line and could be across a river or behind you instead of in the direction that you are travelling. Once you have chosen a Point of Interest, you should instruct the GPS to route you there. Once the GPS has calculated your route, it will show you the correct distance and expected arrival time. Remember to zoom out and eyeball the route before you proceed. After following the selected route for a few minutes, again check the distance, ETA etc. to be sure that you’re on the right track. You might have to find another camp, fuel station or shop as the one that you have chosen might be in the wrong direction. By default the GPS will search around your current position. However, shortly after you crossed the border you might want to search for a place to sleep in Windhoek. It is possible to set the location from where your GPS should search. This setting is slightly different for most units; have a look at your user manual and the ‘search near’ option. How to search for a POI that is not near your current position. If you have a Tracks4Africa SD card loaded on your GPS, you will have access to a wealth of information which is to be found under the Extras category of your GPS’s main menu. All these points are already on the map, which means your GPS can route you to anyone. If you view these Points of Interest under Extras, you will see additional information like contact details, descriptions, photos, etc. Some of the detail shown in the Africa Guide. 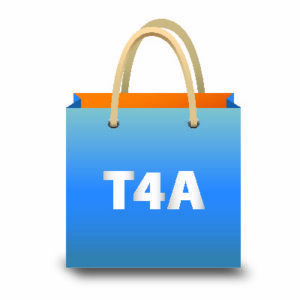 More importantly, Tracks4Africa has set its own categories for this guide, which is called the T4A Africa Guide. These categories, which will add more flavour to your trip, include scenic routes, mountain passes, picnic spots and viewpoints. Also included is critical information like opening hours and contact details of border posts. Tracks4Africa has set its own categories in the Africa Guide. Previous PostTop African destinations for your 2017 bucket listNext PostBe informed if you venture off the beaten track! In your Article entitled ‘More uses for your GPS than navigation’ you have a picture taken across an Adventure Bike’s handlebars. It has a very unusual Mirror setup (the mirrors are below the bikes bars). Is it possible to get some more details about these mirrors ? That setup belongs to Wouter Brand, the founder of Tracks4Africa. You can contact Wouter on tsedu.tshisele@gmail.com for more information.